It's that time of year again. It's Bake Off Season. My workplace holds a Charity bake-off every year and it's highly competitive. Last year I made redneck Breakfast Cupcakes and placed third. This year I am baking two entries and looking forward to eating some of the delicious baked goods my colleagues are baking! I cam second this year with my Persian delight doughnuts. I was super excited about this dish. 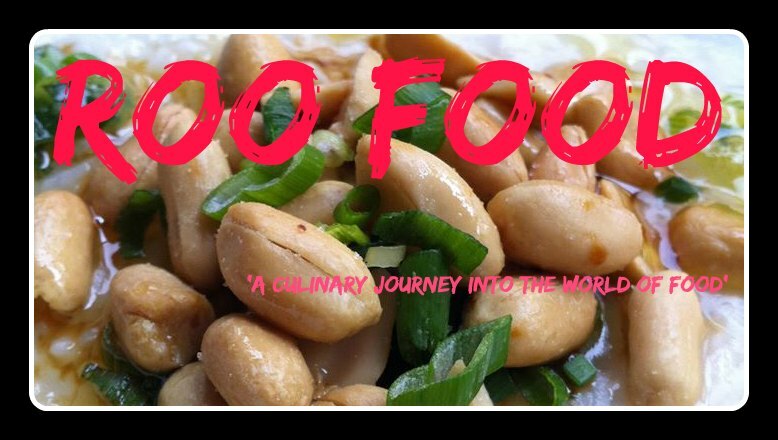 This first dish I have been thinking about for a while. 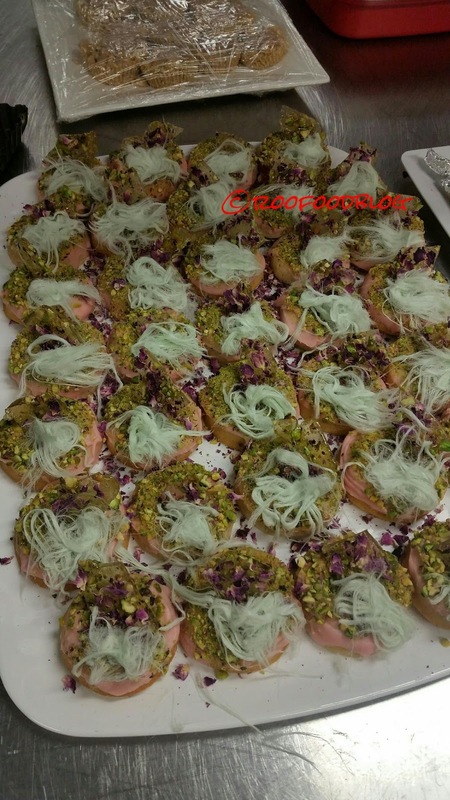 A baked cardamom doughnut with white chocolate rose ganache and pistachio crumb, rose petal and pistachio toffee and pistachio pashmak. There are a few components but fairly easy to put together. Preheat the oven to 160°C. Lightly grease a doughnut pan with melted butter. In a large mixing bowl, whisk together the flour, baking powder, sugar, cardamom, and salt. Add butter and rub through dry ingredients until crumb like texture. Add the hot milk, yogurt, eggs and vanilla and stir until combined but do not over mix. Transfer batter to a piping bag. Pipe into greased doughnut pan to about 2/3 full. Bake in oven until doughnuts spring back. Approx 12 - 14 minutes. Let cool for a few minutes before turning out onto a wire rack to cool completely. Chop pistachios to small pieces. 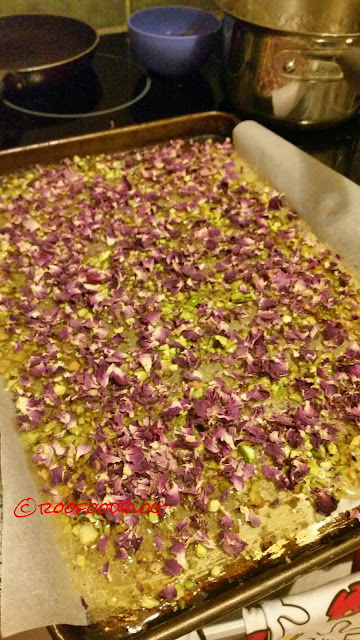 Sprinkle pistachio onto lined baking tray. Place 1 cup sugar and 1/4 cup water in a pan over low heat and stir until the sugar dissolves. Increase heat to medium. Do not stir! Cook for 5 minutes until a medium golden caramel. Pour toffee over nuts and sprinkle rose petals over the top. Set aside to cool completely before snapping into shards. Toffee can be made a day ahead and stored in an airtight container. 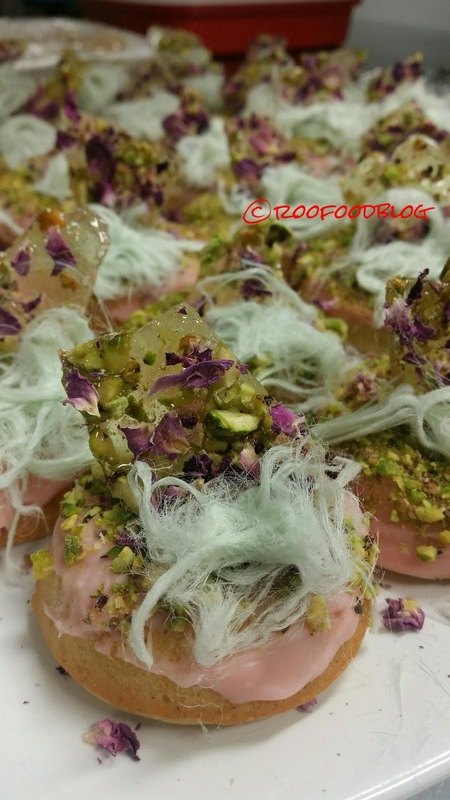 To put altogether, ice cooled doughnuts with the rosewater and white chocolate ganache, sprinkle with pistachio crumb, top with a shard of pistachio and rose petal toffee and a pinch of pistachio pashmak!